Ancient Israelites spent many years as slaves to the Egyptians. When the Pharaoh refused to let them leave, God sent ten plagues to change his mind. Passover is the tenth plague. 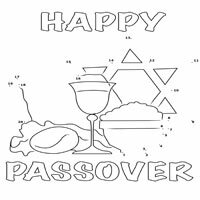 You can celebrate the freedom of the Israelites with this festive dot to dot activity page.